"Image Courtesy of the Randolph Carter Family"
Civil rights leader and political activist Randolph Warren “Randy” Carter of Seattle, Washington, was born November 15, 1913 in Riverside, California to Charles and Hettie Carter, the youngest son of four boys. Carter was a track star in Riverside, receiving national recognition as the All Conference Track Champion in the National College competitions at San Diego State University in 1937. Carter continued his track career at Whittier College in Whittier, California, where he won the Small College Relay Championship of the United States in 1937. There he set a record that was unbeaten for 20 years. He graduated from Whittier in 1938, and received his Master of Social Work from the University of Southern California in 1962. On June 29, 1941 Carter married Willhemina Feralyn Lewis of Pasadena after a year-long courtship. From 1943 to 1944 the Carters lived in Stockton, California while he was Director of the Market Street Unlimited Service Organization. In 1944 he moved to Los Angeles to serve as a group worker for the All Nations Foundation. He remained there until 1950. In both Stockton and Los Angeles, Carter was a pioneer social worker in the area of gangs and youth violence. Between 1950 and 1952 Carter was a Pullman Porter. 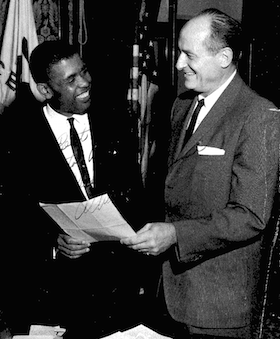 In 1952, Randolph and Willhemina moved to Seattle, Washington, where he became the Community Relations Secretary of the Urban League. In 1955, he joined the King County Juvenile Court as a Juvenile Probation Officer (making him the first black Probation Officer in the State of Washington). He remained with the Probation office until 1959. In 1961, he served as Executive Secretary of the State Board against Discrimination, the official agency in the state of Washington charged with combatting racial and religious discrimination. Carter then worked for the Catholic Community Services of Western Washington, focusing on African American youth in Seattle’s Central District. His work, alongside his partner, Edward Grindrod, led to letters of commendation from President Lyndon Baines Johnson and Washington Governor Daniel Evans. In 1971, shortly after his death, Catholic Community Services of Western Washington renamed its 52-year-old Family and Learning Center, the Randolph Carter Family and Learning Center. Carter belonged to a number of civic, social, and religious organizations. He was a member of the Seattle chapter of Alpha Phi Alpha Fraternity, Inc., as well as a longtime member of the First African Methodist Episcopal (AME) church in Seattle, Washington. He also belonged to the International Wiseman’s Club, the Chief Seattle Council of Boy Scouts and the National Association of Social Workers. He was Chairman of the Board of Management of the East Madison YMCA, and served also on the boards of the Metropolitan YMCA, National Association for the Advancement of Colored People (NAACP), and Sheltered Workshops for the Central Area Industries. He was the first Vice President of the Central Area Motivation Program (CAMP) Board. CAMP was one of the nation’s first anti-poverty agencies. Throughout most of the 1960s Carter was a member of the Central Area Committee for Civil Rights (CACRC), an organization of leaders and activists who directed the civil rights movement in Seattle. In 1965 Randolph Carter became one of 11 founding members of the Alpha Omicron Boule of the Sigma Pi Phi Fraternity. Randolph Carter died on February 9, 1970 at the age of 56. He was survived by his wife Willhemina Feralyn Lewis Carter, his daughter Lucile Feralyn Carter (Perry), daughter Carolyn Edna Lewis Carter, son Randolph Carter II, and six grandchildren. The Randolph Carter Center, which is part of the larger Catholic Community Center of Seattle, was named in his honor. "Randolph Warren Carter: Winning, Serving, Loving," (Seattle: The Randolph Carter Industrial Workshop Association, 1988); Sixty-Ninth Annual Commencement, University of Southern California, June 14, 1962; “Randolph Warren “Randy” Carter, ’38,” Plaque of the Whittier College Athletic Hall of Fame, 1981, Whittier College, Whittier, California.